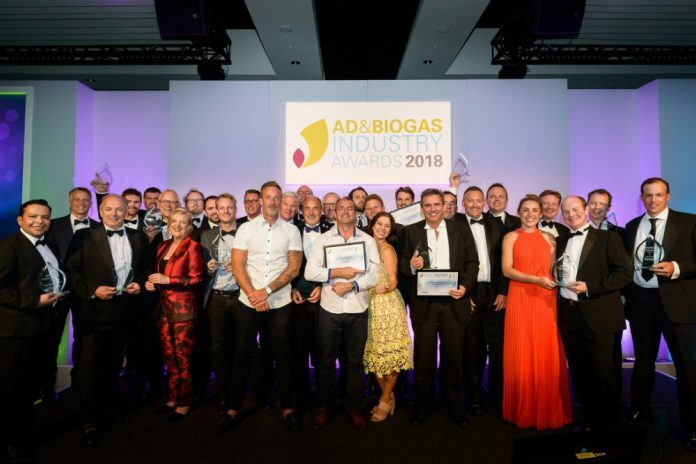 Applications are now open for the AD & Biogas Industry Awards 2019, a gala ceremony recognising the best AD innovators from the UK and around the globe. The awards, which include prizes across 14 categories, will be presented at a black-tie ceremony featuring a three-course dinner, a renowned host, after-dinner entertainment, and an opportunity for attendees to network with industry leaders. AD and biogas technologies convert organic wastes and crops into renewable heat and power, clean transport fuel, and nutrient-rich natural fertiliser. AD has been recognised globally as a key technology for reducing greenhouse gas emissions, restoring soils, improving sanitation, and improving air quality worldwide. Now in its eighth year, the ceremony will take place on the first night of UK AD & World Biogas Expo 2019 and the World Biogas Summit 2019. These two-located events will bring together industry, policymakers, politicians, academics, and AD operators from the UK and across the globe to discuss the most pressing topics and showcase the most innovative products and services in the AD and biogas industry. All three events are being co-organised by the UK’s Anaerobic Digestion & Bioresources Association (ADBA) and the World Biogas Association (WBA). This year’s award categories include a range of new prizes for ‘Clever Use of Outputs’, ‘Best Food Waste Collection System’, ‘Most Improved Plant’, ‘Best Microdigester’, ‘Best Biogas Plant’ equal to or above/below 1MW electrical-equivalent respectively, ‘Best Biogas Marketing Campaign’, and ‘Most Circular City’. “The AD & Biogas Industry Awards Ceremony will celebrate those who are making an exceptional contribution to the AD and biogas industry both in the UK and globally,” said ADBA Chief Executive Charlotte Morton. “The 14 award categories are designed to showcase achievement and innovation and recognise excellence in each sector of the industry. WBA President David Newman added: “These awards are the highlight of the global AD and biogas industry event calendar and offer a fantastic opportunity to celebrate the companies that are really making strides in best practice in this sector across the globe. The awards take place on 3rd July at the National Exhibition Centre in Birmingham, UK. The deadline for applications is Friday 26th April. Click here to apply.